A few years ago, I used to say I can run my business from anywhere in the world as long as I have my laptop with me. This was because all my information and the programs I used to run my business were stored on my laptop. I never really liked that setup because if something were to happen to my laptop, I would be pretty screwed. There was also the hassle of syncing the laptop with the desktops. Oftentimes, I never brother to do it and ended up not having files that I needed. Today, I no longer need my laptop to run my business. I just need access to a Web browser. The Web browser can be on my laptop, my iPhone or a public computer at the library (or an Apple Store), it doesn’t matter. I never have to worry about syncing or missing any files. All my datas are stored in the cloud using the latest security and backup technologies. I have replaced all the programs I used to run on my comp with Web browser based programs. I’ve done it to the point where there are almost no programs installed on my Macbook Pro other than what came with OSX. With the exception of iMovie 09, every other program I use to run my online business runs from a Web browser. This has completely liberated me from having to carry around my laptop when I go on trips. Sure, I still bring the Macbook but it’s nice to know that should something happen to it, I can just swing by any Apple Store, buy another Macbook and I’m back in business with nothing lost. Here are all the browser based programs I use to run this blog. John Chow dot Com is powered by WordPress, which runs from any web browser. I can log into my blog from anywhere in the world as long as I have access to a web browser. Before blogging came along I created content sites using MS FrontPage. I would create the page on my computer using FrontPage and then upload it to the web server using a FTP program. That tied me down to one machine. With WordPress, I can access my blog from any machine, anywhere in the world. In the old days, I used MS Outlook to handle my emails. I would never brother to sync the emails between the laptop and desktop. This caused all kinds of problem because I had different emails on different machines. Then there was the time I reformatted the computer and forgot to backup my emails. 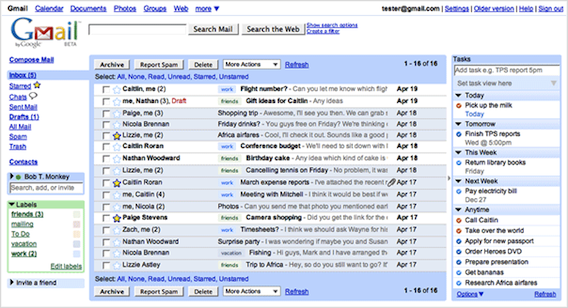 Moving my email to Gmail has been one of the best moves I’ve ever made. Gmail has one of the best spam filters in the business and I never have to worry about having different emails on different machines. Gmail also makes a good backup service. Because each account has 8GB of storage, you can use it to backup your WordPress database. Just make an email address for your WordPress database, then use the WordPress database backup plugin to email a copy of your DB to the Gmail account once a day. Should something happen to your database, just log into the DB Gmail account and recover it. My blog newsletter is handle by Aweber. Their interface is all browser based and can be used from any computer. With Aweber, I can quickly create sign up forms and auto responders. Every money making blog needs a mailing list and Aweber is by far the best in the business. My list is the main reason the blog makes the income that it does. If your blog doesn’t have a list, get one now! Forget Microsoft Office. You don’t need it anymore. All my documents are handle by Google Docs. Why pay for Office and have it take up space in your computer when you don’t have to? One of the best features of Google Docs is sharing and collaboration. If I’m working on a project with other people, I can give them access to my docs so they can work on it as well. 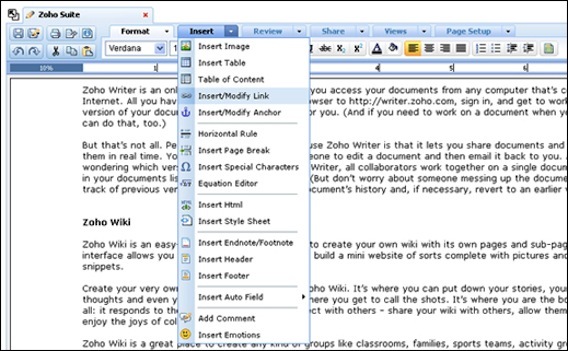 If you prefer the look and feel of MS Office, then you can use ZOHO, which as far as I can tell, is pretty much MS Office on the Web. I’m shocked Microsoft hasn’t sued them out of business yet. 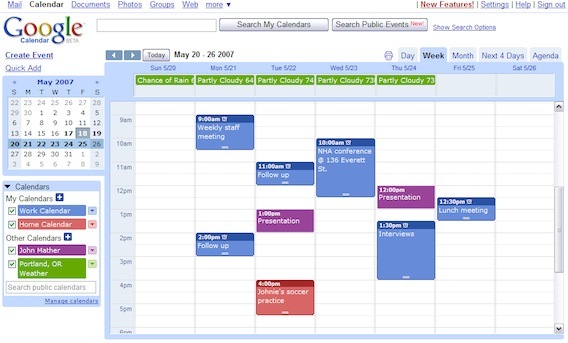 I used to use Outlook to handle all my appointments and reminders. I now use Google Calendar to do the same thing. I like how I can share my calendar with others so they know what I’m up to and can even schedule themselves in. Before I discovered Hootsuite, I used TweetDeck to handle my Twitter account. Hootsuite is the best Twitter client I’ve used to date. It has many advantages over Tweetdeck, the most important of which is that it’s browser based. I can use HootSuite from any computer and not just my own. HootSuite also uses way less resources than TweetDeck but offers additional features like timestamp tweeting and stats so you can find out how many people clicked on your links. 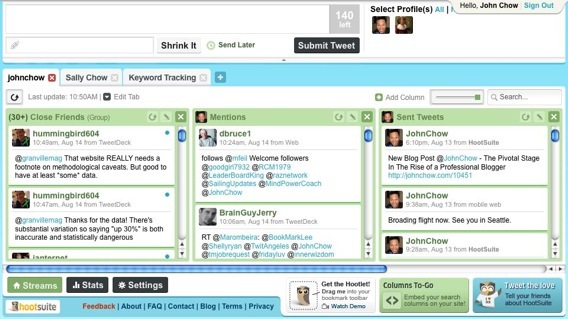 With HootSuite, you can manage all your Twitter followers and accounts in a single application. You can create as many columns as you want in order to separate your followers into groups. You can add new tabs to track keywords or other Twitter accounts. Add your Ping.fm application key (and a Group, if desired) to send new tweets from HootSuite to your Ping.fm account. Add your blog RSS so it sends out a new tweet when you have a new blog post. HootSuite even allows you to add editors in case you don’t want to write the tweets yourself. I can only see celebrities and the President of the United States using that feature. 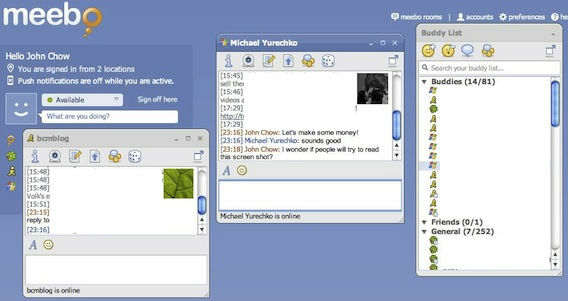 Meebo allows me to run all my Instant Messengers from one browser window. Before Meebo, I was using Adium and I still prefer Adium over Meebo. When I am on my Macbook, I will use Adium. When I’m on a public computer I will check my IM with Meebo. I used to store all my images on my local comp. Now I store them all on Flickr. Flickr allows you to store up to 200 photos for free. Go beyond that and they will want you to upgrade to a Pro account, which gives you unlimited storage. A Pro account cost $24.95 a year ($47.99 for two years). That to me is a no brainer. I have lost photos before because of a hard drive crash and I didn’t have a backup. Those are memories that I can’t recover. While there is always a chance that Flickr might experience some kind of failure, I know their backup systems are far better than what I use. Flickr integrates with WordPress if you run the Flickr Photo Album for WordPress. This plugin allows you to pull in your Flickr photosets and display them as photo albums on your blog. The plugin provides a very simple template that is fully customizable. Since all my blog photos are pulled from Flickr, I save money on bandwidth cost. Most of the time, the only thing I need to do with an image is resize it. For that, the built in Preview program in my Macbook can do it. However, there are times when I need to edit a photo before uploading to Flickr. For example, I might need to add a watermark or blank out some sensitive information (like in the Meebo screenshot). For those occasions, I rely on Pixlr. 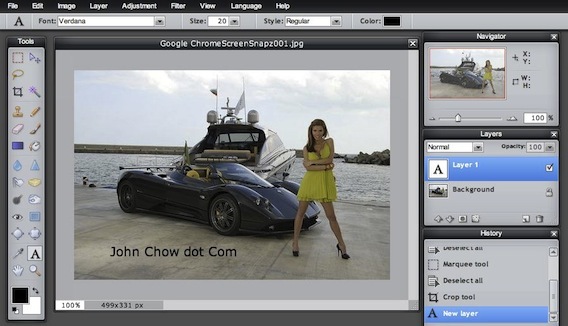 Pixlr looks and works just like a Web based version of Photoshop. With the exception of the really advanced stuff, pretty much anything you can do in Photoshop, you can do in Pixlr. And it’s free! I used to store all my videos on Vimeo until YouTube started allowing me to embed HD videos. Now, I’ve stop uploading my videos to Vimeo and I’m going to let my Vimeo Pro account expire. Why pay for HD when you can get it for free with YouTube? Editing videos is pretty much the only thing I do that is not browser based. However, because iMovie comes with OSX, I can easily work on my videos from any Mac. If I’m on a PC, then I’ll have to settle for Windows Movie Maker but I wouldn’t wish Movie Maker on my worst enemy. Many people feel unsecured about keeping their information in the cloud. For me, I actually feel more secure by having it there. I have lost information before when things were stored locally. I have yet to lose a single item from the cloud. Plus the freedom it gives you is unmatched. A few days ago, I walked into an Apple store, used their Macbook for an hour, accessed all my information, set up an email marketing campaign and made $1,500. By having all my programs running from a Web browser, I can make money from any computer, anywhere in the world. The above Web browser based programs are what I use to run John Chow dot Com. For affiliate marketing, I use a bunch of other browser based programs. But that’s for another day.